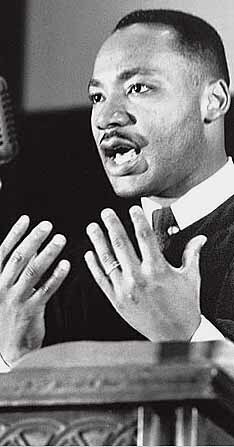 As a Federal holiday, MLK Day falls on the third Monday of January, which is a different date every year. But today, January 15, is the actual anniversary of his birth. “I Have A Dream” is overwhelmingly his most famous speech, just as the “Letter from a Birmingham Jail” is his most famous writing. The Dream speech draws much of its power from the fact that although it is a secular speech about the life of all Americans, delivered in a secular setting, it nevertheless crosses the line into Christian preaching and proclamation. In his political rhetoric, King was constantly appealing to biblical categories like the kingdom of God, the image of God, and absolute standards of right and wrong established by God. To grasp what he is doing when he unleashes the power of religious language to make moral arguments about national policy, it is helpful to hear how he talks when he is actually preaching on a Biblical text, from a pulpit in a church. An MLK altar call! Never mind that the theology behind King’s sermons was the theology of high liberalism; the point is that he brought Christian theology, and religious rhetorical appeals, from his church life into the political arena. “Yes, sir,” says someone in the audience. Throughout some of his sermons, the congregation encourages him on in that responsive style that is part of the black church culture and heritage. The best encouragement interjected by the audience members into the sermons: “Make it plain!” Every preacher should have somebody shouting this at them about five times per sermon. Perhaps the boldest of Martin Luther King’s sermonic moves is Paul’s Letter to American Christians, in which, after a brief introduction, King delivers the entire message as if reading a letter written by Paul. He flags the letter as “imaginary” right at the beginning, but then starts inviting the congregation into the game, talking about how it is postmarked “from Ephesus,” and how he has struggled for weeks to translate it from its original Greek. The sermon was delivered at Dexter Avenue Baptist Church, Montgomery, Alabama, on 4 November 1956. There are a few audio excerpts from it here. It’s worth reading in full, as King chastens capitalism but demolishes communism; scourges Protestants and rebukes Catholics; excoriates the opponents of civil rights and then counsels the defenders of civil rights about how to resist spiritual pride. You have allowed the material means by which you live to outdistance the spiritual ends for which you live. You have allowed your mentality to outrun your morality. You have allowed your civilization to outdistance your culture. Through your scientific genius you have made of the world a neighborhood, but through your moral and spiritual genius you have failed to make of it a brotherhood. Americans I must urge you to get rid of every aspect of segregation. The broad universalism standing at the center of the gospel makes both the theory and practice of segregation morally unjustifiable. Segregation is a blatant denial of the unity which we all have in Christ. It substitutes an “I-it” relationship for the “I-thou” relationship. The segregator relegates the segregated to the status of a thing rather than elevate him to the status of a person. The underlying philosophy of Christianity is diametrically opposed to the underlying philosophy of segregation, and all the dialectics of the logicians cannot make them lie down together.